Supergirl is out of this world! Melissa Benoist is phenomenal as Carol King in this wonderful, wonderful show! The cast is superb, the dialogue tight, the story fascinating, and the music evocative, especially for anyone who grew up in the US in the second half of the 20th Century! Super fun and blown away by the pipes of MB. I love everything, especially the music from back in the day everyone was so amazing!!! It was funny, sad and happy, I love this musical there isn't a bad comment at all, I would love to see it again sometime. Definitely a show stopper to see. How many singers and songwriters came out of Brooklyn in the 50's and 60's that became legends? Streisand, Diamond, Dion, Sedaka, etc. they've all gotten their credit though. What Carole King did went virtually unacknowleged until now. What an unbelievable tribute to her life. This play was truly spectacular. I love her and the acting was so great I thought Carole was on stage. Truly a great tribute to one of the great American Poets of our time. Thank you for giving me two hours of musical bliss. Can't wait to see it again! Thank you. Chilina Kennedy and the cast of the "Beautiful" were very fanny, refreshing to the my eyes and ears. Loved every moment of the show. Simply beautiful performance was fantastic . A great show from beginning to end. Powerful story, powerful music, talented cast. Cannot remember the last time I enjoyed myself as much as seeing this fantastic production. The show has so many wonderful tunes. Jessie Mueller nails it. She channels Carole King and it's a great show. See the show before she leaves it. If you liked Jersey Boys, this is better! Loved it. I saw it by chance and loved it. I learned so much about the talent and life of Carole King and the period of music starting int he 60's. The combination of music, songs, and story was wonderful. 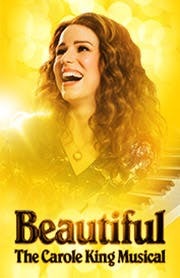 The main character who played Carole King was convincing in her role. I remember Carole King fromt he 1970's but did not know how much she contributed to the musci we all love. I would compare this play to Jersey Boys but a much better story and more varied music. Loved it. I would see it again. I loved the entire show and cast, but the lead Jessie Mueller is UNBELIEVABLY talented as Carole..............She does everything, playing the piano, singing, and of course acting! It was a real heartfelt experience.... When she played one of the last songs I cried....the one when she was going to leave her friends/co-writers/composers...that really made you feel like you were there at that time and what it must have been like for Carole......Loved it! Thanks Carole for allowing your life to be portrayed so wonderfully!! I rank Beautiful as high as my favorites of Hairspray, Memphis, Jersey Boys, Lion King, and as with those, I would see it again. The actors are fantastic. The audience was a mixed age crowd and immediately gave a standing ovation. I, along with most, didn't realize how many songs were written by both duo teams that you will come to know. A fantastic show that deserves to stay on Broadway a long time. Bravo ! !